Those of working with the book, Initiation: Human and Solar (or if you have the Alice Bailey CD ROM) you will be confronted with a chart which is of the utmost importance in understanding human nature — the chart of the Constitution of Man. How can this “map” of points and triangles be of use to us — for the map is not the territory. A number of the points on this map relate to areas of the human constitution which are common knowledge to all human beings — for instance, the physical, emotional and mental vehicles. However, most people do not think in terms of “permanent atoms” — tiny centers of force which generate the various personality vehicles. Only highly trained psychics can ‘see’ these atoms, yet occult theosophical literature has assured us that they exist, that they are indeed “permanent” (enduring throughout the history of the human being (as a human being), and that they are contained within the causal body. Other parts of this map are, to most, “occult” — hidden from sight, certainly, and in most cases, even hidden from recognition. Such are the spiritual triad and the threefold monad. As evolution proceeds, experience of these various levels gradually comes to the awakening consciousness. Then the points, lines and figures on the “map” cease to be abstractions, and begin to signify something real, something actually experienced. Probably, the map makes full sense only to the Self-realized Master or, perhaps, Chohan of the sixth degree, who is focussed in the monad, having experienced and transcended all the lesser points. It is out goal to be able to recognize vibrations coming from any of the ‘areas’ on this map, and to be able to access them at will — still a distant prospect for most of us. It is useful for the student to memorize this map (in general) so that he/she can ‘locate’ the impressions to which he/she may be subject. The idea of what we might call ‘dimensional location’ is important to the development of the disciple upon the spiritual Path. It prevents confusion and thus reduces maya, glamor and illusion. Location of the finer forces is not so much spatial as it is vibrational. 1. Will or Power.................The Father. 3. Active Intelligence...........The Holy Spirit. The highest aspect of our nature (as Man) is threefold. At the core of the monad is pure spirit, which is identical in every being. Spirit is one and yet three. We enter here the mystery of the Trinity — one and yet three — three and yet one. Spirit is entirely unitary, and yet, it embodies the three fundamental aspects of divinity. There is no spirit who is not, simultaneously, the Father, Son and Mother/Holy Sprit. We each of them — completely so, though in time and space we may seem to emphasize one or other of these aspects/qualities. The question arises whether “Mother” is the same as “Holy Spirit”. The answer is both yes and no. The third aspect of divinity is, in a way, dual, and both the Holy Spirit and the Mother represent it, but the Holy Spirit is the more active aspect of the third aspect, and Mother is more receptive. Together, however, they are the entirety of the third aspect. When is the spirit or monad aspect of ourselves contacted? Probably there is an intimation of this aspect at the second initiation and following, and a more conscious impact at the third. The fourth and fifth initiations definitely deal with the monad which increases in influence with each succeeding initiation. The Father aspect of divinity holds the secret of life. The Son aspect holds the secret of radiance. The Holy Spirit contains the spirit of manipulative intelligence — intelligently arranging all things for the expression of the Good. 2. Intuition.........................Buddhi, Love-wisdom, the Christ principle. 3. Higher or abstract Mind...........Higher Manas. It seems plausible enough to talk about the monadic trinity “reflecting” itself in the egoic trinity, but what really is reflection. We might speak of a similarity of quality or function occurring at a lower vibrational level. There is likeness or similarity but not identity. Something of the higher quality can be intimated or appreciated through contact with the lower quality which reflects the higher. Understanding how to work with the Law of Analogy is important as we attempt to reach the higher aspects of our nature. The spiritual triad, therefore, reflects the monad. Spiritual will or atma is the reflection of monadic will; intuition or buddhi is the reflection of monadic wisdom (one might ask why); the higher or abstract mind or higher manas is the reflection of the aspect of monadic activity. The monad and the spiritual triad are the most impersonal aspects of our nature; the monad, though threefold, emphasizes the oneness of the Trinity and the spiritual triad emphasizes the distinctness of the three aspects (though the sense of unity is found throughout the triad). If the higher ego makes itself felt in “advanced men”, who are they. We might say that these are the individuals who are in process of opening the fifth petal of the egoic lotus upon the higher mental plane. From that time forward, the higher ego can influence the personality within the three worlds. By the time the first initiation occurs the ego has become decisively magnetic and influential. By the time the third initiation is reached, the higher ego is in decisive control of the personality. Perhaps the fourth initiation represents the time at which the higher ego is in complete control of the personality. Some imperfections (relatively considered) may remain at the third degree, but of course, perfection is a relative matter no matter what being in cosmos is under consideration — whether a Solar Logos, a Constellational Logos or even the unfathomable Being Who informs our galaxy. As for the Probationary Path, it is the Path of Aspiration upon which the aspirant is constantly tested to prove his fitness for further progress. Who is the arbiter of his/her readiness? The Solar Angel (or ‘over-lighting soul’) from one perspective; the Master from another. Finally, the aspirant himself/herself is the arbiter of his own success or failure. We do not really know our fitness until we prove it to ourselves. Perhaps this is the most important kind of proof — all part of the ongoing process of Self/self-discovery. 1. A mental body................lower manas. 2. An emotional body.........astral body. 3. A physical body.............the dense physical and the etheric body. The aim of evolution is therefore to bring man to the realisation of the Egoic aspect and to bring the lower nature under its control. The second important reflection is that of the higher ego as it reflects itself within the personality. We are well familiar with our personality nature and have been for many thousands, even millions, of years. What may not be so familiar is the quality of the soul as it reflects itself within the personality. The soul vehicle is described in various ways, but one significant way is as a “golden lotus”. The lotus has petals and tiers of petals. The tier of three “sacrifice petals” reflects itself in the mental vehicle of the personality; the tier of three “love petals” reflects itself in the astral or emotional body; the tier of “knowledge petals” reflects itself in the etheric-physical nature. There is a central group of petals called “synthesis petals” at the center of which is the famed “Jewel in the Lotus”. These three petals and the “jewel” can be thought of as reflecting itself in the personality as a whole. The development of the personality is sequential, though there may be much overlapping of phases as evolution proceeds. Our present purpose (and the purpose of most of those who tread the spiritual Path at this time, is to know the soul or “higher Self” and to bring the personality under the control of that soul. This is no easy matter, though in theory, it is deceptively simple. Many, many lives are spent in this process, and there are many phases to be discriminated. The threefold method of approach to the realization of the egoic aspect is meditation, study and service. When the soul or higher ego reflects itself in the personality, the refinement of the personality occurs inevitably. 1. Physical Plane — the 7th Plane: This is the lowest of the seven planes (or vibra­tory levels). It is matter as we know it, and originates in the first of the three solar systems. 2. Astral Plane — the 6th Plane: This is the major plane of glamor and illusion. This vibratory level is related to the dynamics of feelings and emotions, or attraction and repulsion. Te astral plane if the plane of desire, or of gravitation towards the not-self. 3. Lower Mental Plane — Part of the 5th Plane: Upon this vibratory level, thought­­forms are created and received. The lower reasoning and planning faculties are found here. From the plan, man correlates sense data and coordinates his environ­ment. 4. Causal Body on the Higher Mental Plane: This is the ‘home’ of what we call the soul. The Solar Angel (the angelic Guide and Mentor who remains with us for millions of years) works principally through this vehicle. 5. Higher Mental Plane — the Higher Part of the 5th Plane: The three higher subplanes of the mental plane comprise the higher mental plane. Here the causal body or egoic lotus finds its place. On the highest of the subplanes of the higher mental plane is found the mental permanent atom which is the seat of the abstract mind. The abstract mind allows us to generalize and think in patterns, so the mental design in which all concrete objects (including concrete thoughts) have their place can be discerned. 6. Buddhic or Intuitional Plane — the 4th Plane: This is the plane of harmony, unifying love and an intuition which reveals the whole. This plane is the middle aspect of the spiritual triad (atma-buddhi-manas), and is the vibratory level towards which humanity as a whole aspires. Upon this plane is found the “clear cold light” which reveals truth as it really is, unmediated by any thoughtforms. 7. Atmic or Plane of the Spiritual Will — the 3rd Plane: This is the plane from which the Will of God — the Planetary Logos — is recognized and accessed. It is plane of Divine Law expressed through Divine Thought. All life in the lower five worlds (or planes) is controlled from this plane of Divine Will. The Divine Plan as it is intended by the Planetary Logos is held on a strict course as a result of the energy emanating from this plane — the highest of the three planes upon which the spiritual triad of man is found. 8. Monadic Plane or Plane of the Spirit — the 2nd Plane: Upon this plane or vibratory level, the highest aspect of the human being is found — the spirit aspect. The monad or spirit is the “eternal pilgrim” who, in ages past, left the “Father’s Home” on a mission of redemption. This mission has taken the monad (a “Lord of ceaseless, persevering devotion”) into the lower three worlds — i.e., into the lower three planes — the mental, emotional and physical. 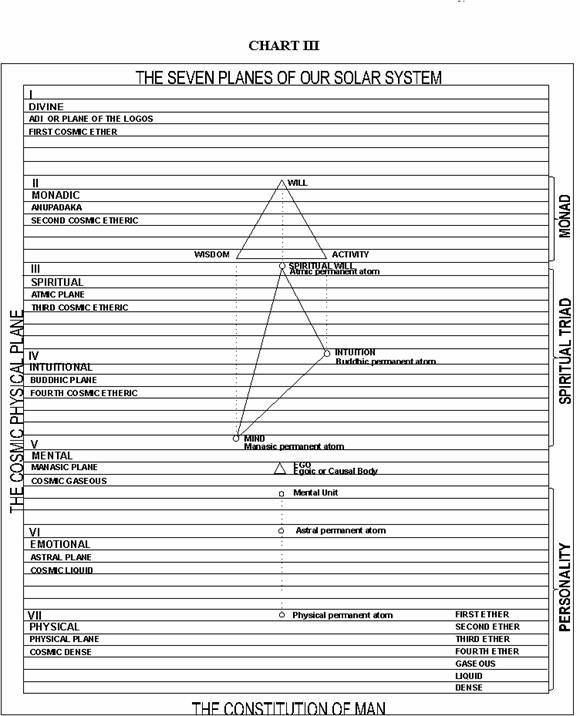 For all practical purposes, the second plane is the plane of Divine Archetypes, and of the first forms to be found upon the cosmic physical plane (composed of the seven systemic planes — here being tabulated). The monadic plane stands ‘above’ the five worlds of human and superhuman evolution, and is, as far as man is concerned, the plane of true liberation. Attaining this plane, man becomes (relatively) a “free spirit”. 9. Logoic Plane — the 1st Plane: This plane is the atomic plane of the seven systemic planes. The Lord of the World (Sanat Kumara) has His principal focus on this plane and the Christ (the Lord Maitreya) is just attaining consciousness and effectiveness upon it. This plane is called the “Sea of Fire”, and from it emanates the energy which animates the entire cosmic physical plane (comprised of the seven systemic planes here enumerated). The Council Chamber of Shamballa is found principally upon this plane. From it all dynamic, creative impulses go forth, inspiring life upon the lower six planes. Only a Master of the seventh initiation (such as the Christ) can begin to focus upon this plane. 1. Each of the seven planes contributes a kind of ‘matter’ to the formation of certain types of vehicles of expression appropriate to that particular plane. These vehicles are called “bodies”, or “vestures”. The highest vesture of which we are presently aware is the monadic vehicle or vesture upon the monadic plane. This vehicle is dissolved when consciousness focuses upon the highest of all our systemic planes — the logoic. Perhaps, upon that plane, can be found another unnamed vehicle which allows an ascending being to function on that level. 2. Evolution demands that all the seven planes be intelligently, lovingly and power­fully linked together — so that energy impulses may pass from the highest to the lowest and from the lowest to the highest. This is not yet the case, and what has been called the “divine circulatory flow” is not yet fully achieved. 3. Humanity is presently learning to link the lower two and a half planes to the higher mental plane, and thence to the buddhic plane. Links with the atmic, monadic and logoic planes are largely theoretical for most human beings. Still a beginning must be made. 4. The method of linking all planes together is called the antahkarana — which is an energy stream of living light, linking first the mental unit with the mental perma­nent atom, and thence with the buddhic and atmic permanent atoms, and finally with the monad. 5. It takes many lives to completely build an antahkarana. All efforts to think and act selflessly and with a broad point of view are steps in the right direction. 6. The antahkarana leads to the impersonal life, which is really the supra-personal life. 7. To understand the Constitution of Man is a necessity. All that is needed for true spiritual progress is an accurate knowledge of the Constitution of Man, and a knowledge of “the next step ahead” — plus the willingness to take it. 8. Occultism is based upon law and science and a true knowledge of the form. Mysticism is an important aspect of approach to the true Occult Path, but mysticism alone will not suffice. Solid knowledge of the true “nature of things” must be added to the mystic’s longing for ‘divine participation’. Once the Constitution of Man is truly mastered, the longing, aspiring mystic has a much greater chance of fulfilling his/her aspirations. 9. There are many additional technicalities which could be discussed in relation to the chart distributed with this commentary, but it is sufficient to begin with the basics, which once mastered, will make it possible to build firmly and on the basis of a foundation of light. 10. Much glamor and illusion can be eliminated if a student will learn what the human being is and is not. Steady progress is then possible, and all development will proceed gradually, sequentially and inevitably from stage to stage and ascending with each initiation plane by plane — ever a higher planar focus being achieved.